Wedding 101 hosted a Rock Star-themed style shoot featuring products from many of their “rock star” wedding vendors representing all of the major wedding categories—photographer, videographer, floral designer, cake designer, beverage service, make-up artist, wedding dress…oh, and a bride—local songwriter Laura Veltz. Joe Hendricks Photography handled the shooting and took some amazing shots using numerous locations and creative vignettes surrounding the very photogenic Factory. 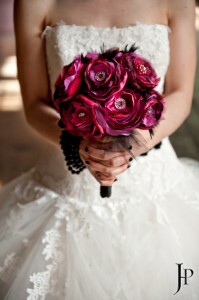 WhimWed’s most rockin’ bridal bouquet was featured in the shoot—a red and black, multi-layered, feathered bridal bouquet. Who says a bridal bouquet needs to be mostly white? This bold bouquet is mostly amazing! 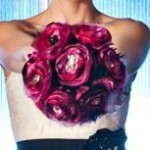 This breathtaking, couture bouquet is composed of over a dozen of WhimWed’s signature chic, multi-layered, fabric flowers. 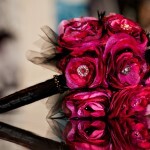 Each handcrafted flower is made of high-quality satins and accented with a unique jewel center, interspersed with soft, black feathers. 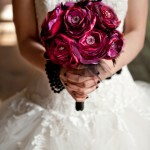 Its stem is wrapped with bold, black satin, accented with a rockin’ ring of rhinestones, topped by a light bed of organza. 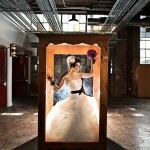 Industry-leading wedding blog Rock N’ Roll Bride published this style shoot on 5/10/11: Nashville Rock Star Styled Shoot. 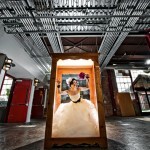 Read the blog post for a complete list of featured vendors. View our style shoot behind-the-scenes pics on our Facebook Page. Watch videographer John Jordan’s short film: Rock Star Video. 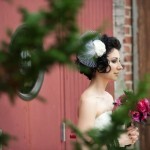 This entry was posted in Style Shoot and tagged bold, cool, fabric, factory, feathers, Franklin, Hendricks, rock, rock star, style, Wedding 101. Bookmark the permalink.